Formed of seven brilliant-set panels, each with an amatory trophy of bow, quiver and torch in a laurel-wreath oval suspended from a ribbon-tie, framed by foliate brilliant-set bands. 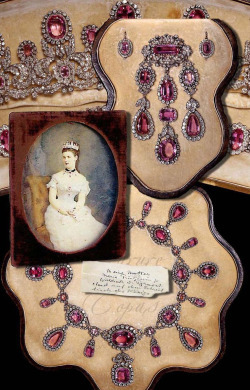 The diamonds were taken from a scroll and ribbon-pattern collar*, which itself had been made with stones taken from seven 12-pointed stars and a pair of diamond star earrings, given by Queen Mary’s grandmother, the Duchess of Cambridge, in 1885. 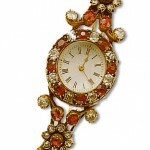 These gifts, in 1885, were presumably to mark the Princess’s 18th birthday. 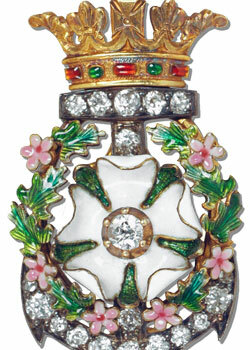 Diamonds were also removed from a floral diamond spray given by her aunt, Augusta, Grand Duchess of Mecklenburg-Strelitz, in the same year 1885. 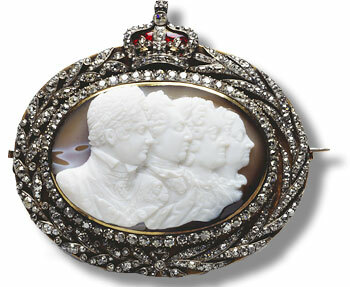 Queen Mary, like her mother-in-law Queen Alexandra, favoured deep collar necklaces for most of her life, due to her long slim neck and the high fashion of the time. 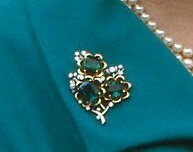 The style was not adopted either by Queen Elizabeth The Queen Mother, to whom the necklace was given when Duchess of York, or by The Queen, who inherited it in 2002, who has worn it only once. Wedding gift from the Duke of Westminster, made as a necklace with small leaves and large diamonds with surroundings. 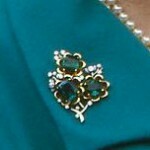 Queen Mary wore the Westminster Gift, as small tiara with her famous Diamond TROPHY-OF -LOVE Collar. 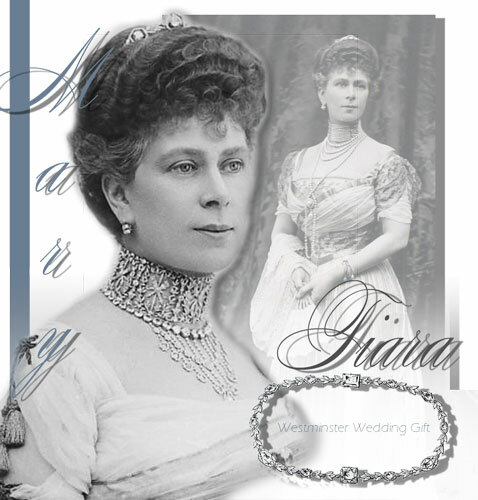 For her marriage in 1893 to the Duke of York,the future George V, the Princess received a very considerable quantity of jewellery; the majority was of diamonds and pearls. 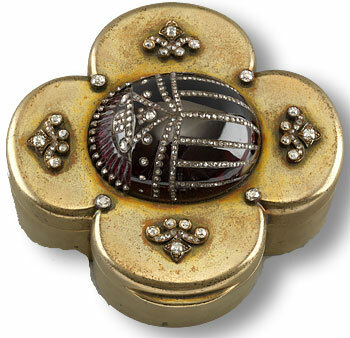 Generous gifts from her family and from the extended royal family vied with spectacular offerings from all round the United Kingdom and across the Empire. 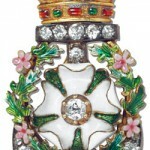 Among the more significant jewels, exhibited at the Imperial Institute, were three tiaras, twenty-six bracelets, forty-four brooches and fifteen necklaces**. 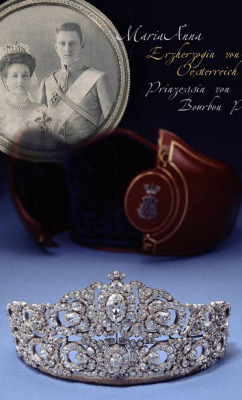 Diamond necklace from the Duke of Westminster see above in the picture as small tiara, with small leaves setted with diamonds and 4 large diamonds with surroundings. Pearl and Diamond Collier de chien | choker from the Thakore of Gondal – above on the left worne. 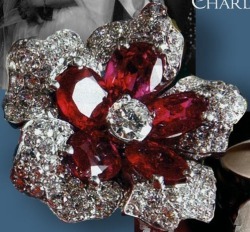 Ruby and diamonds bracelet incorporating a detachable centrepiece in the shape of a rose from the County of Cornwall later in the possession of Queen Elizabeth II. 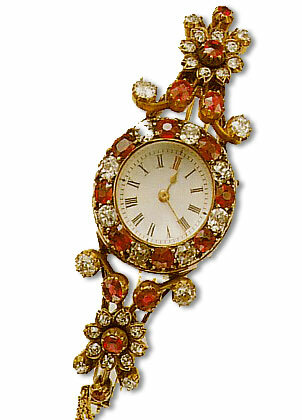 Little gold watch and chain inclosed in a small glass case formerly in the possession of the Empress Josephine from Dr Chittenden. Small birthday book bound in gold and tortoiseshell, containing a miniature in ivory of the royal family and bearing a coronet and short inscription in diamonds and enamel – from the Baron and Baroness Lowenstein. Diamond-set scarab and four stylised fleurs-de-lys Silver-gilt, straight-sided, quatrefoil-shaped box, with hinged lid, mounted with a red glass; from the members of the British Embassy in Berlin. 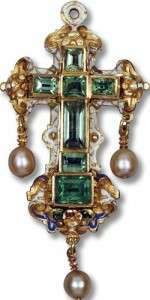 Brooch – beautiful jewel, the gift of the Worshipful Company of Carpenters. It consisted of the arms of the Company in diamonds, surrounded with brilliants, and surmounted by the motto of the Company, Honour God. 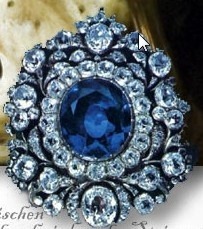 **Source:Queens Diamonds,Hugh Roberts; thanks to Laura!